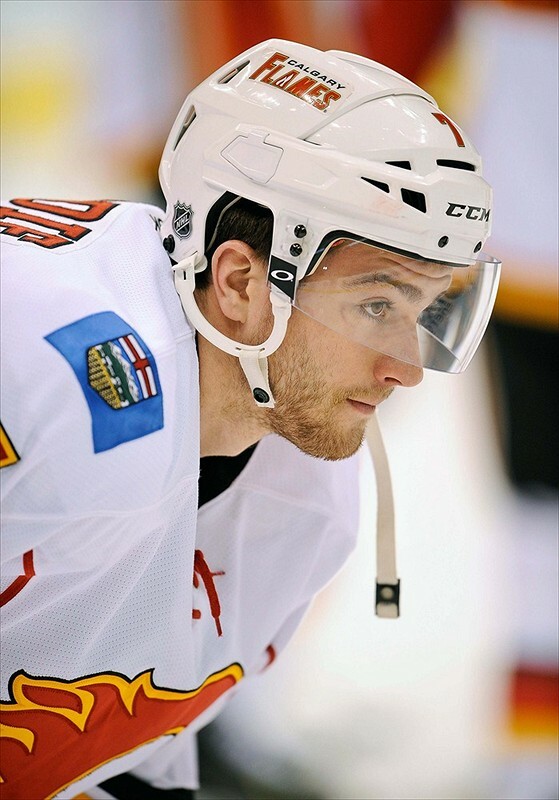 Last season, the Flames hoped that T.J. Brodie wouldn’t regress from his impressive end to the 2012-13 season and that they could get a full season out of Mark Giordano, their excellent albeit injury-prone captain. The great news is that Brodie continued to improve and that Giordano, despite missing a chunk of games, emerged as a bonafide top-flight NHL defender. The rest of the team is full of question marks. Last year, T.J. Brodie and Mark Giordano emerged as one of the better defense pairings in the entire NHL. Kris Russell went from being a cast-off from the St. Louis Blues to being a regular NHL blueliner. Beyond that, Dennis Wideman was injured half the year (and it’s hard to tell how good/bad he truly was), Chris Butler was reliable and Ladislav Smid was brought in to anchor the back-end. Beyond that, the team had a rotating cast of bottom-pairing characters, with only rookie Tyler Wotherspoon showing flashes of much. Well, Brodie and Giordano appear to be the real deal, and they are back! Heck, Mark Giordano – who wasn’t drafted and got brought into the Flames organization as minor league filler – got a lot of votes for the Norris Trophy last season. Brodie’s also rapidly improving. Beyond that, the bottom six is likely to be filled out with Smid, Russell, Wideman and newcomer Deryk Engelland, who provides a nice physical edge if not much offense. The big question at camp is who takes the seventh spot: Wotherspoon (recovering from shoulder surgery), free agent signing Corey Potter (ditto), offensively-skilled try-out Raphael Diaz or big-bodied try-out Sheldon Brookbank. Regardless of which direction the team goes, opposition clubs will likely try to isolate Brodie and Giordano, the only possession threats on the team, as much as possible. On the farm, along with whichever guys don’t end up as #7 in Calgary, we likely have some combination of Sena Acolatse, Patrick Sieloff, John Ramage, Ryan Culkin and Brett Kulak as the crew in Adirondack. Kulak was pretty good at the end of last season in a late-year call-up to Abbotsford, but the bulk of the defensive corps are pretty green. In the WHL, they have big mean Keegan Kanzig and offensively-minded Eric Roy. Both are likely turning pro in 2015-16. In the NCAA, they have freshman Brandon Hickey at Boston University and junior John Gilmour at Providence College. Both probably have at least a couple years before turning pro. In Europe, they have puck-mover Rushan Rafikov in Russia and big stay-at-home Swede Adam Ollas Mattsson. One or both of them should be playing pro in North America next season (with the other one coming over the next season), but nothing’s certain until a contract is signed.